In order to meet the globally increasing requirements on flexible, biological wastewater treatment plants, Multi Umwelttechnologie (Mutag) is now offering their basic engineering support in the form of a franchise-concept. In this way, companies engaged in marketing and/or operating this technology, or being interested in using this technology as additional know-how can benefit from Mutag’s many years of experience and development work. What is different with the Mutag MBBR power pack unit and what is essential? In Germany, the production of standardised water treatment plants is currently not profitable due to high manufacturing and transport costs. In case that the steel structures and the pipework are manufactured according to construction plans directly at site in the respective destination country where the plants are urgently needed, suchlike plants can be produced at significantly lower costs. Additionally, such a support is contributing to the further development of the destination countries. In a franchise concept, companies in these countries are given the possibility to use the long term know-how and engineering basic guidelines. They will hence neither need any additional development nor highly-skilled employees. Thanks to this franchise concept, the business idea of offering the production and the operation of compact, flexible wastewater treatment plants is possible to be brought into priceconscious markets and developing countries. It is essential that highly efficient and flexible plants can be produced and operated directly on the spot. In this way, any potential further costs can be kept as low as possible. The efficiency of the Mutag MBBR power pack unit becomes obvious when comparing it directly to other containerised plants which are available in the market. 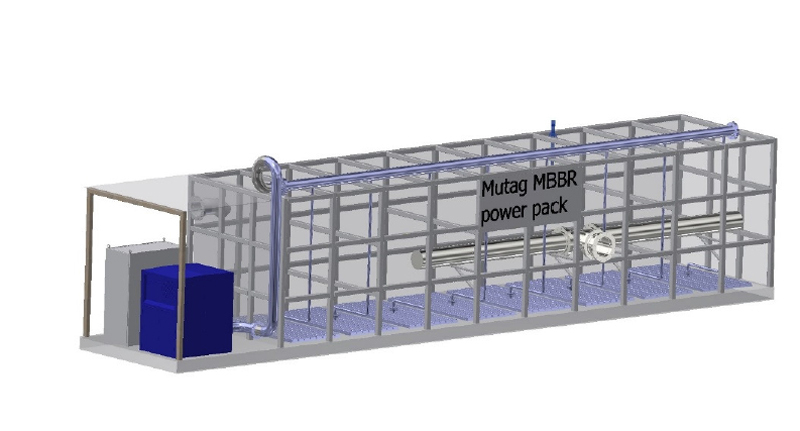 A Mutag MBBR power pack unit in the framework of a 40ft container having dimensions of 12.0x2.3x2.5 is designed for municipal wastewater treatment at a capacity of 2,400 m³/d, load of 6,600 PE and 400 kg/d BOD at 15°C. Hence, the removal performance of the Mutag MBBR power pack unit at the same MBBR reaction tank volume is a double or a multifold of other available containerised plants which are comparable in size. For the operator it is also essential to know that only one Mutag MBBR power pack unit will be required instead of two or even more containers. As a result, additional costs can be further reduced by providing savings in both capital and operational expenditure. What are the benefits provided by this franchise concept? The franchisee is not only supplied with the Mutag BioChip high performance carrier media and the membrane air diffuser panels. He also is brought into the position to use the long term know-how of MBBR-process- und application technology, biofilm-technology and support, starting from the designing of plants up to the calculation and layout of the particular components. Also the constructional design of retention screens, as well as mass balance, flow-sheets, basic P&ID, datasheets of equipment components, and construction plans are included in the scope of supply of the franchisor (Mutag). Of particular importance is the operational support after the construction of the plant. For this purpose, the franchisor Mutag provides complete commissioning- and operation manuals, as well as documents, and supports the operating staff by means of evaluation of the operating data and by giving recommendations for an optimal plant operation. Why is the efficiency higher compared to other containerised MBBR plants? The removal efficiency in a smallest possible MBBR reaction tank (-volume) can be significantly enhanced by using and combining certain selected components. By using highly effective membrane aeration panels, very fine-bubbled process air is being supplied, ensuring that the oxygen quantity required for the high biological removal performance can be transferred into the water. If the supply of this high oxygen mass would not be ensured, the aerobic removal process would not take place. It is of particular importance that sufficient active biomass is maintained inside the MBBR tank in controlled manner. Compared to other carrier media in containerised plants, controlled biomass growth is realized by using the highly efficient Mutag BioChip carriers. It is essential that the biomass fixed in the pore structure of the approx. 1.1 mm flat chip (disc) is sufficiently being supplied with substrate and oxygen from both sides by diffusion. Consequently, the entire biomass is kept active and no inactive sludge will clog the pores. Due to the carriers contacting very smoothly with each other in the moving bed bio-reactor, the biofilm (biomass) inside the pore system of the Chip is constantly kept at a layer thickness of approx. 0.5mm on both sides of the Chip. Any excess biomass is sheared off. Hence, the defined depth of the pores ensures that the biofilm is optimally controlled in its thickness and provides hence a very high biological activity. This effect provided by the Mutag BioChip is unique in its nature. It is indeed very surprising to see that this positive effect with its highly advantageous features is being recognized rather rarely among experts. Contrary to the Mutag BioChip, the biomass on other carriers made of PE is highly susceptible to being flushed off the carrier surface. Furthermore, the biofilm on such carriers cannot be controlled in thickness. The positive, advantageous effect of the Mutag BioChip is impossible to reach with injection-molded plastic carriers. Along with the cost saving benefit provided through the production of the plant components (pipework and steel structure) in the destination countries, the plant operation by the franchisee is made possible or simplified due to the support provided by the franchisor (Mutag). Furthermore, BOT models are possible as well (BOT = Build, Operate and Transfer). In such cases, the plants are arranged on foundations and are hence not attached to the ground. Whenever required, these plants can be dismantled and be re-installed for further use in another location. This is what makes the Mutag MBBR power pack to a suitable solution for temporary applications, e.g. worker camps in the mining industry or in the oil and gas exploration sector, or military camps, etc. Which containerised plant concepts are available? In the overall concept, there are different standardized components available, consisting of MBBR technology for COD/BOD removal, nitrification or Anammox process. For the denitrification process, containerised MBBR units with optimised mixing equipment are available. Depending on the application requirement, the standardised modules can be arranged in individual combinations in order to adapt the system for the respective application task. Depending on the respective demands and requirements, plant concepts for the application of MBBR/IFAS technology combined with MBR technology (membrane separation technology) can be provided. The highest efficiency is reached by the combined application of the two key-components: the oxygen transfer system and the Mutag BioChip carriers. This combination allows for the highest possible biological removal rates in the smallest possible reactor volume, as well as for significant savings in capital and operational expenditures. The production of units on the spot in accordance with the construction plans provides cost savings on the one hand, and it promotes the wastewater infrastructure in the destination countries on the other hand. At the same time, the franchisor Mutag provides support to the franchisee/operator in all process-technological, biological or operational matters.